As the seasons change and it turns to fall, horse owners will face a couple of new concerns with their horse care management: bot flies and pasture maintenance. What are bot flies? Bots are technically known as Gasterophilus species and there are three versions of this parasitic fly: Gasterophilus intestinalis, Gasterophilus nasalis, and Gasterophilus haemorrhoidalis. They differ mainly in where they attach their eggs to your horse. G. intestinalis lays its eggs on your horse’s body and legs; whereas, G. nasalis lays its eggs on your horse’s neck and under the jaw. G. haemorrhoidalis is much less common, but lays its eggs on your horse’s lips. Bot flies travel miles to find an equine host, at which point they attach their eggs quite firmly to a horse’s hair. The first-stage larvae hatch when stimulated by your horse licking or biting at the attached eggs. These larvae make their way to the mouth and remain in the mouth, tongue and gums for about a month. Then they move on. The second- and third-stage larvae attach to the lining of your horse’s stomach. They remain here for 9 to 12 months, draining nutrients from your horse. They eventually mature and are passed in the manure. When the adult flies emerge in late summer or fall, they immediately set about mating and depositing eggs on your horse to restart the cycle. Bot flies, which are large and look somewhat similar to bees, can irritate your horse as they lay their eggs. Years ago, bots were thought to be fairly benign. That is no longer considered to be the case. Once inside and established in your horse’s stomach, they drain nutrients and may cause irritation to the stomach lining or more serious issues. Treatment of bots requires multiple stages. You can stimulate the eggs to hatch early by washing your horse’s legs with warm water. The larvae then fall to the ground and die. You can also wipe your horse’s legs and areas with attached eggs with an insecticide, or scrape the egg collections off your horses’ hair with sandpaper or a sharp comb. However, you should assume that you did not catch all the bots in those early stages and follow-up with a dewormer that is approved for killing bots, such as Horse Health Equine Ivermectin Paste 1.87%. Discuss the timing of this deworming with your veterinarian, as it will vary in different areas of the country. Late summer and early fall also means that you will have to conduct some pasture maintenance to help keep your horse healthy. You can greatly reduce the parasite load in your fields solely by dragging and breaking up manure clumps. The exposure to light and air will kill many developing parasites. Rotating animals into different pastures can also help with parasite control. Equally important is cutting any fields that have not been well grazed. By doing this, you encourage the growth of good grass and cut down on weeds. Horses will graze more eagerly once a field is cut; they prefer the new growing grass to the old grass. The growing grass also provides more nutrients. It is important to cut weeds before they reach the stage of seeding out; otherwise, you are simply aiding in the spread of thistles, burdock, etc. With the removal of thistle and other prickly weeds, horses will be able to graze on all areas of the pasture without irritation from those plants. Dragging or harrowing breaks up manure and encourages more even grazing as well. Keeping pastures trimmed will also cut down on pest animals such as woodchucks, whose dens can be dangerous for horses. Coyotes will avoid a field with short grass and stick to hedgerows; although, they may hunt for mice and voles right after you cut the field. If you are in a drought area, you may need to pull your horses off pasture temporarily to let the fields recover. You can set up a rotational grazing system or simply use a turnout area for awhile and feed hay. 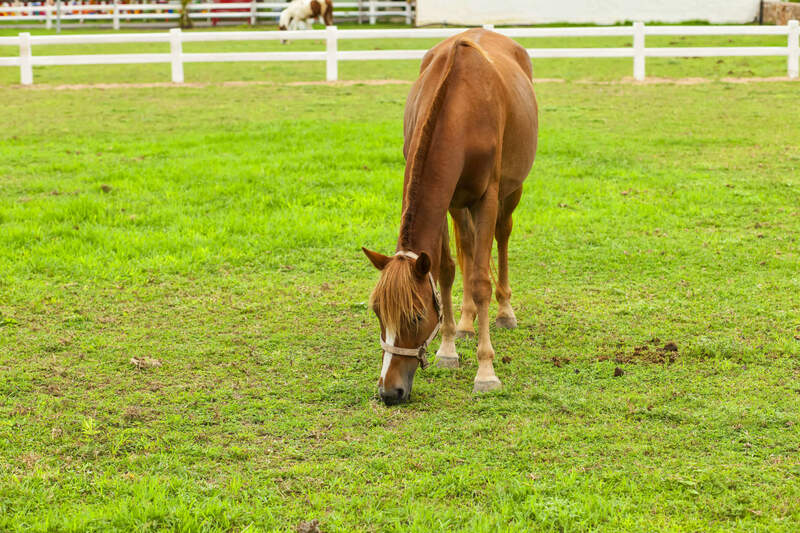 By implementing multiple strategies for keeping your pasture clean, your horse will be able to enjoy his pasture without worry of parasites or prickly weeds. Happy Grazing! Horse Health is a trademark of Farnam Companies, Inc.